The OnlineNaira BankErrand service is what you need if you need to pay money into someone else's bank account. When you give us the instruction from within OnlineNaira, we will do it on a same day basis. There are times it is very inconvenient to be at the bank and sometimes or difficult to get someone to send to the bank; this is the time the OnlineNaira BankErrand comes in handy. When you instruct us using the BankErrand app, we will pay your money to whoever it is and also send them an email alerting them there is money waiting for them from you. It is important that you do not use this service to make a withdrawal into your own bank account as your payment will be delayed as a result. This service is designed to help you pay someone else and help to reduce unnecessary visits to the bank. 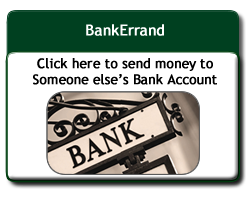 To do BankErrand in Onlinenaira, pls login and click on SEND MONEY, choose BankErrand from the payment options and enter the amount you want to send. Provide recipient bank details and submit. Alternatively, click on the first payment option (Pay OnlineNaira Member), enter "bankerrands" as the member to pay, enter amount and provide recipients bank detail sin the space for description. That is really all we require and your money is sent into their account with your name as reference. If you need to send money to yourself, please do a WITHDRAWAL as we do not allow the bankerrnads service to be used for OnlineNaira members. OnlineNaira has the capacity to handle over a milliom BankErrand trnasactions in any one day. Tell us if you have more than one bank transaction to do on a regular basis and we would be glad to offer you a dedicated BankErrand Channel at a reduced fee. If you prefer to automate your BankErrand, we would also do that for you. Why not have a chat with a member of staff today to see how OnlineNaira could help your business send money to the bank accounts of many Nigerians on a regular basis or when you have the need? How much do you charge for BankErrand? We charge 1% + 2000. Why should you go to queue up at the bank when OnlineNara could do it for you? Please remember that you can get in touch with us at anytime to confirm any procedures - info@onlinenaira.com. Better still, you can chat with our staff online now.